Takeaway: With the death toll climbing across all age groups, the opioid crisis has become America’s biggest public health challenge. TREND WATCH: What’s Happening? 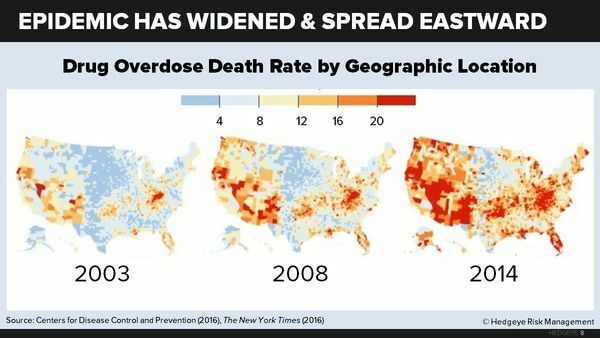 U.S. drug overdose rates are hitting new highs as opioid addiction ravages communities around the country. The annual death toll of drug overdoses now exceeds that of car crashes, guns, and previous health scares. Public health officials are desperately seeking ways to stem the tide before it gets even worse. 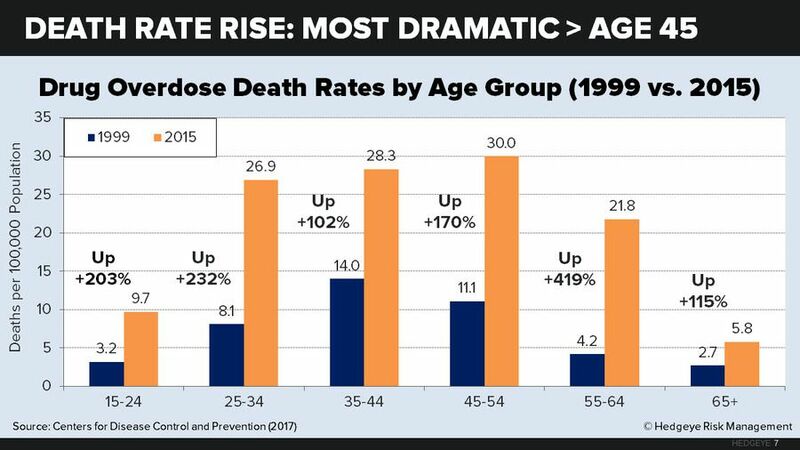 Our Take: Though the addictions and deaths span all age brackets, it’s Boomers and Xers who are pushing up overdose rates the most—a divergence from typical demographic patterns and a reflection of a risk-taking ethos that has followed these generations into midlife and beyond. While early efforts to combat rising overdose rates are promising, regulators and public officials still have a long way to go. In late June, Missouri Attorney General Josh Hawley filed suit against opioid manufacturers Purdue Pharma, Endo International (ENDP), and Johnson & Johnson (JNJ). These companies are accused of using deceptive marketing and downplaying the risks of the drugs that have left millions addicted—echoing a wave of similar lawsuits from Tennessee, Ohio, Illinois, Mississippi, New York, California, Washington, and the Cherokee Nation. At the root of this slew of litigation is the U.S. opioid epidemic, which many media outlets, public policy experts, and doctors are calling the worst public health crisis in American history. The lethal consequences are exacting a toll on users, families, and law enforcement from coast to coast. The numbers are staggering. In 2015, more than 52,000 Americans died of drug overdoses, according to the latest data from the Centers of Disease Control and Prevention. Nearly two-thirds of these deaths (approximately 33,000) were linked to opioids such as OxyContin, Vicodin, heroin, and fentanyl, a figure that has quadrupled since 1999 and is now the highest on record. This figure equates to 91 opioid deaths each day. 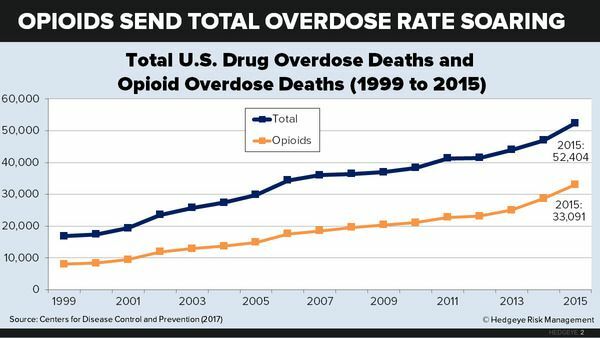 Astonishingly, since 2011, the increase in opioid overdose deaths (+10,307) has accounted for virtually the entire increase in all overdose deaths (+11,064). 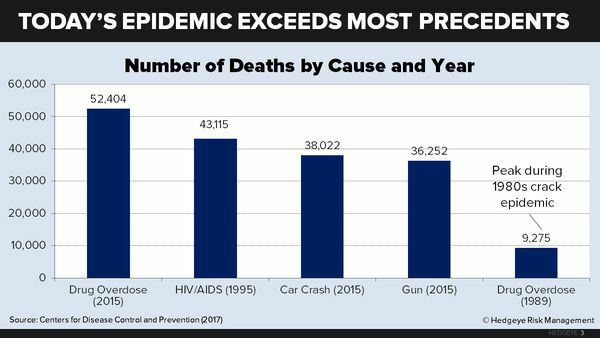 The number of fatal drug overdoses today exceeds the death toll of past heroin epidemics, the crack epidemic of the 1980s, and the peak of the AIDS epidemic in the 1990s. 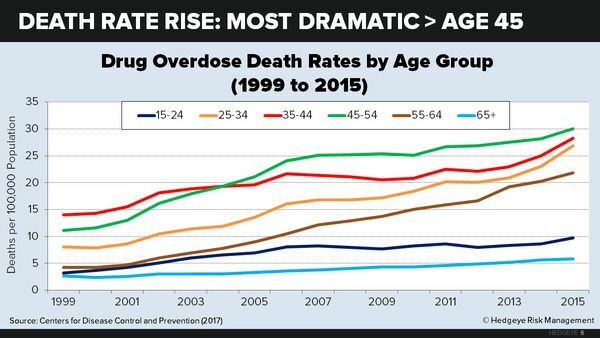 Drug overdoses now kill far more Americans than car accidents or guns. And the numbers keep rising. A preliminary analysis by The New York Times estimates that there were 59,000 to 65,000 drug overdose deaths in 2016. It’s even possible that these figures are too low. According to a recent CDC study of mortality classification processes in Minnesota, many deaths (roughly 20%) clearly resulting from chronic opioid addiction are being attributed to other causes, such as pneumonia. 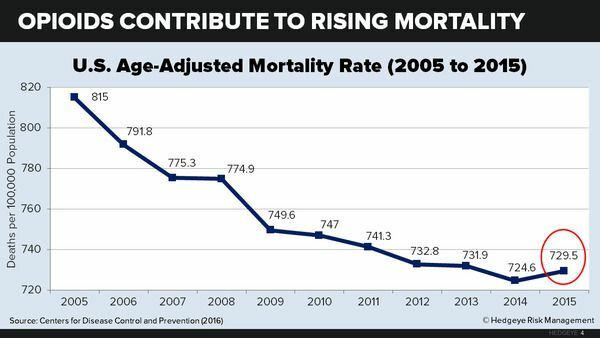 The crisis is so significant that it has contributed to worsening mortality. (See: “More Deaths, Fewer Births.”) In 2015, U.S. life expectancy saw its first dip since 1993, sliding from 78.9 to 78.8 years. Also in 2015, the U.S. age-adjusted mortality rate posted its first year-over-year increase in a decade, climbing from 724.6 to 729.5 deaths per 100,000. To be sure, there were other reasons behind these figures, including increased mortality rates for leading causes of death like heart disease. But CDC researchers cite a jump in unintentional injury deaths, namely drug and alcohol overdoses, as a major contributor. As the number of opioid fatalities has shot up, the public face of drug addiction has shifted. Race: whites hit hardest. 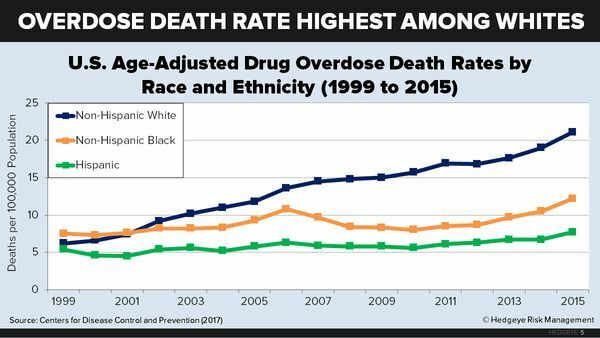 In contrast to past drug epidemics, which devastated communities of color, opioids are killing white Americans at double to triple the rates of their black and Hispanic peers. 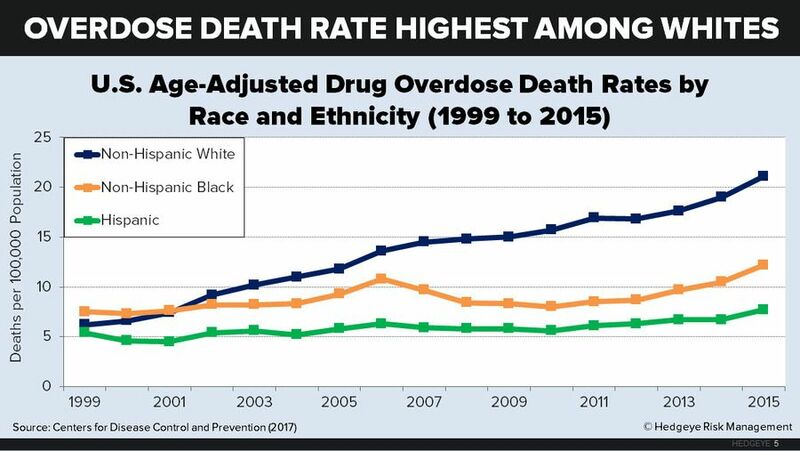 The overdose death rate for whites has shot up more than threefold since 1999 (to 21.1 deaths per 100,000). The problem is most acute in rural areas, but transcends socioeconomic class and income level. Age: middle age hit hardest. Race is hardly the only thing different about today’s drug epidemic. The age profile of victims has shifted as well. We typically associate drug use with the young. In the late 1980s, young Xers played a dominant role in the crack cocaine scare. In the late 1960s and early 1970s, young Boomers played a dominant role in deaths from heroin and “psychedelic” drug experimentation. But it’s a different story today. Though drug overdose death rates have risen for every age group in recent years, late-wave Boomers (ages 55 to 64) have seen the most dramatic percent rate growth (from 4.2 per 100,000 in 1999 to 21.8 in 2015—a 419% rise). The highest death rate (30.0) is among early-wave Xers (ages 45 to 54). In a historical list of drug-related celebrity deaths compiled by drugs.com, the average age of death in the 1960s and 70s was 35. Over the last five years (since 2013), it has been 49. Geography: American heartland hit hardest. The geography of the crisis has changed over time as well. 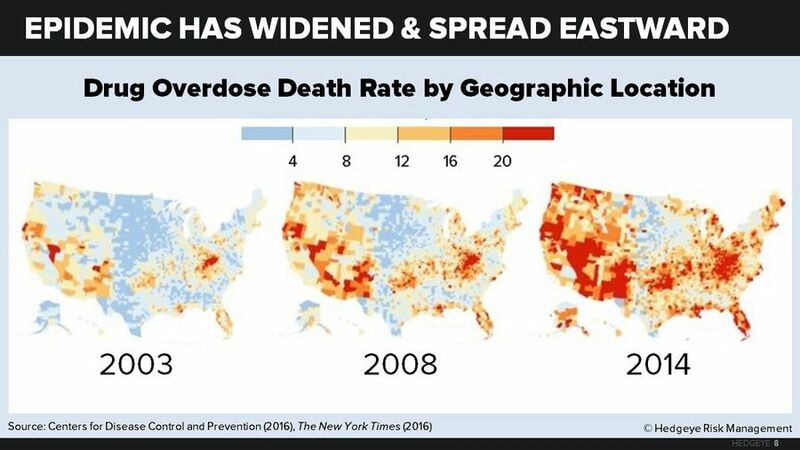 A decade ago, overdose deaths were largely concentrated in Western states like New Mexico and California. By 2014, they had spread across a more diverse range of states, and the epicenter of the crisis had shifted eastward to the Rust Belt, rural Appalachia, and New England. Many victims come from overwhelmingly white areas in states like Ohio, Rhode Island, West Virginia, Kentucky, and New Hampshire. Today, leading the nation in per-capita overdose deaths is Ohio’s Montgomery County, which is on track for 800 fatalities this year and where the coroner’s office routinely runs out of room for bodies. What factors are behind this startling surge in overdose deaths? A lagging economy. Many commentators link the opioid epidemic to economic difficulties that have sunk the career prospects of the white working class. Princeton economist Anne Case, for example, recently suggested in The Washington Post that struggling Americans are self-medicating “to soothe the beast” brought on by stress and poor health. Research by another Princeton economist, Alan Krueger, found that 44% of prime working-age male labor force dropouts—roughly 7 million men—take pain medication on a daily basis, and in two-thirds of cases, they take prescription drugs. These men also report lower levels of emotional well-being than their employed counterparts. But this theory is incomplete. Ours is far from the only nation experiencing economic trauma—yet no other country is afflicted by an opioid epidemic. We consume an astonishing 80% of the world’s supply and 99% of the hydrocodone supply, according to the American Society of Interventional Pain Physicians. 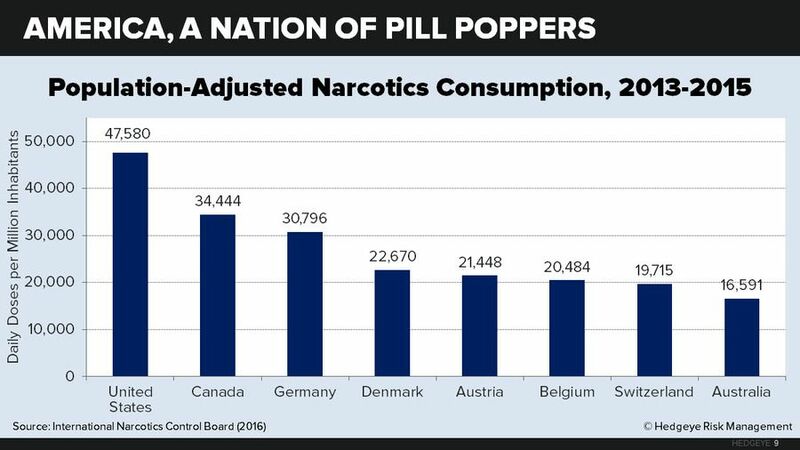 The United States is the worldwide leader in narcotics consumption—and it isn’t even close. The U.S. medical-industrial complex. A better explanation points to something uniquely American: the U.S. medical-industrial complex, which has facilitated the massive proliferation of prescription painkillers. Beginning in the 1990s, U.S. doctors faced pressure to treat pain more seriously as “the fifth vital sign.” They turned to opioids, which pharmaceutical companies were pushing hard (and as the recent lawsuits allege, in the pursuit of profit) as a safe solution. The U.S. health care system equates quality of care with the ability of doctors and hospitals to deliver what patients ask for, incentivizing providers to pull out the prescription pad. The Centers for Medicare and Medicaid Services even links reimbursements to patient surveys that ask whether “your doctors did everything they could to help with your pain.” Most doctors report that they take these patient satisfaction surveys seriously. CDC data show that in 2012, doctors wrote 259 million opioid prescriptions—enough to give a pill bottle to every adult in the country. Twelve states wrote more prescriptions than there were people. Which states? 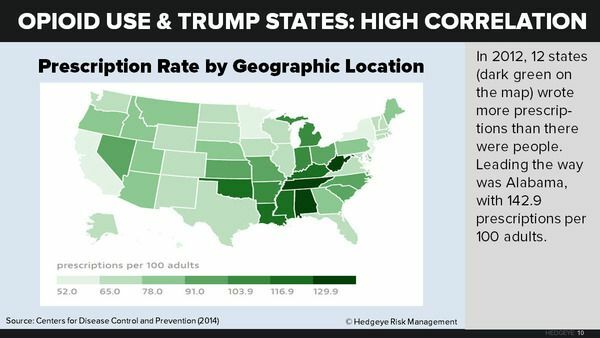 It’s a familiar group: largely pro-Trump red-zone states with high rates of obesity and chronic disease. From there, various other factors have stoked the tide of overdoses. Medicaid pays for access to expensive painkillers—and has done so for nearly one in four beneficiaries, according to a study by Express Scripts, a prominent Medicaid plan manager. CMS data reveal that Medicaid recipients are prescribed opioids at twice the rate of the privately insured, probably because they’re more likely to see doctors with complaints about chronic pain. While Medicaid doles out access to prescriptions, it often doesn’t cover substance abuse treatment. And even after states began restricting prescriptions to curb misuse, addicts turned instead to cheap, plentiful alternatives: heroin, fentanyl, and increasingly, the weapons-grade synthetic opioid carfentanil. Generational and cultural change. Another factor is at play as well. Demographic aging, combined with U.S.-specific attitudes toward health, have combined to form the perfect backdrop for the opioid epidemic. Young people have typically been the focus of public concern about drug abuse. 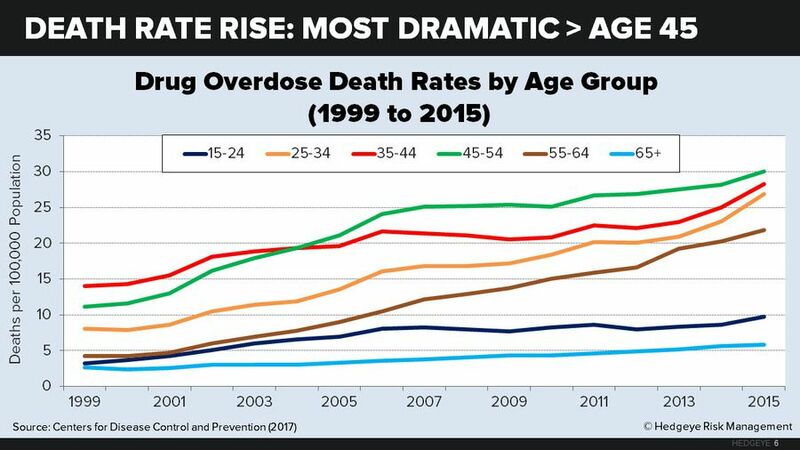 But today, the ones sending overdose rates soaring are late-wave Boomers and first-wave Xers, who have long dabbled in mind-altering substances. They’ve brought the habits of their youth—which some abandoned and others never gave up—into middle age. As Jamie Huysman, the clinical adviser for seniors at a drug-treatment organization and himself a Boomer, explained in The Wall Street Journal: “We were pretty conditioned that we could be rebellious, that we could take drugs, and so this is how we respond today.” Research shows that Americans are more likely than Europeans to believe that “life is perfectible” (in other words, that pain is avoidable), making it all the more likely that a Boomer might seek out substances to deal with the pains of aging. What steps are policymakers and patient advocates taking to combat rising overdose rates? Demanding accountability. Backlash against the medical profession has been loud and plentiful—with Big Pharma taking much of the heat. The fast-growing number of lawsuits against opioid companies points to a newfound desire to hold Big Pharma accountable, with more suits on the way. Making it easier for sufferers to get help. The most useful tool against overdoses is the antidote naloxone, which temporarily reverses the effects of an opioid overdose. Now, dozens of states offer naloxone without a prescription, and the drug is routinely carried by law enforcement officials. The demand has translated into big business for companies such as Adapt Pharma and Kaleo that manufacture and sell branded naloxone products. These companies are under intense pressure to lower their prices to further expand access. Adapt Pharma officials say the company sells two-packs of its Narcanbrand nasal spray to nonprofit groups for $75, while Kaleo gives away its Evzio product for free to consumers with commercial insurance and uninsured people making less than $100,000. A much larger revenue generator, however, is the growing need for rehab centers, along with services to help patients reintegrate into society. In 2014 and 2015 alone, there were 27 transactions in which private equity firms or public companies bought or invested in addiction treatment centers. One prominent buyer has been Acadia Healthcare (ACHC), a national treatment center chain that surged from just six facilities in 2010 to 587 in 2016. And then there is American Addiction Centers (AAC), a chain that went public in 2015 and now runs treatment centers in states from Rhode Island to California. There are some early signs that we’re making progress in the battle against rising opioid use. But we have a long way to go. Because of the intense regulatory pressure against overprescribing, the number of opioid prescriptions has fallen each year since 2012. But thus far, it hasn’t resulted in fewer deaths. To the contrary, more addicts are filling the void with cheaper, deadlier street drugs. Heroin and fentanyl, for instance, have outpaced painkillers to become the leading driver of overdose deaths in many urban centers like Cleveland. Meanwhile, the struggle against addiction has moved from the states to center stage in Washington, where demands for additional funding to fight opioid abuse are stymying Senate Republicans’ efforts to replace the Affordable Care Act. The defining characteristic of the opioid crisis is that it isn’t limited to one group. It’s leaving its mark on Americans of every age: babies born addicted, kids inundating foster care, addicts overdosing in public places, and grandparents who find themselves gaining custody of young children. “Honestly, if something doesn’t happen with this addiction crisis, we can lose a generation of kids,” Robin Reese, the executive director of children’s services for one hard-hit Ohio county, told The Journal. Addiction is unique in that its effects often ripple outward and linger for generations to come, leaving communities grasping to find a way out of an epidemic that shows no signs of letting up.